Hi, its Anish Raivadera here, welcome to our blog. If you are involved in CRM, Marketing, Data Quality, Business Intelligence or anything related to corporate data then this blog is dedicated to you. We look to provide practical help in getting most out of your data. Whether you are migrating data, improving your target audience data or cleansing to improve campaign returns or meet regulations, you’ll find something here for you. My passion is for software and data, and how the two can make significant difference to anyone’s data capabilities. Having undertaken hundreds of data projects in different organisations we see common patterns in the way organisations manage their data. 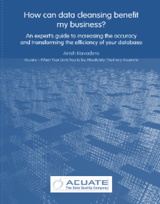 We bring to you our findings and best practices to make your life easier when managing data. Visit our website www.acuate.com for all our offerings, but there are lot of useful posts here as well. To Your Data Success, Anish.